The final season on the WCHA started back in October leading to this point, the end of the regular season. For the second straight year, Minnesota Duluth hosts Omaha for the last series. This season is unlike last year where second place in the WCHA was potentially on the line. This season UNO is trying to hang onto home ice after a promising start and UMD is attempting to keep on a roll as they enter the playoffs almost certainly stuck at ninth place. While playing both teams will be playing, they will also be scoreboard watching to see how the league shakes out. As it looks now from PlayoffStatus, Omaha is odds on to fall from sixth to seventh place being passed by Denver. That sounds good for UMD since Denver is currently one point behind Omaha. In essence, they are saying the odds are better that Denver will win more points versus UAA this weekend than Omaha will win from UMD. Denver has the tiebreak over Omaha. Looking at the possible fourth place finishers, and UMD’s first round opponent, the odds are that North Dakota will be the team. I came up with the same conclusion using the What-if Calculator last week. The possible teams for fourth place, with greater than 10% chance, in order behind UND are Omaha, Denver, and Minnesota State Mankato. We Have Met Before. Omaha is one of three teams UMD plays for two series this season, Michigan Tech and Bemidji State are the other two. The teams played in early November with Omaha coming away with a sweep 3-2 and 6-3. Back then Omaha was on a winning streak and looked to be in the running for the league championship. Since that first meeting, the Mavs have gone on a few losing streaks and find themselves on the edge of home ice in the first round of the playoffs. Currently Omaha has lost four of their last six games. Goalies Get Work. The emphasis is on the plural here. News surrounding UMD has focused on the use of three goalies this season and how seldom that has happened. Well here come UNO who has used four goalies this season. When the preseason ballot for WCHA honors came out, the staff discussed the possibilities. One main point of discussion was first team goalie. I wanted to go with Mav veteran John Faulkner while the staff wanted to go elsewhere. My thoughts were he has been around, was good two years ago, and just had an off year last season. In the end we didn’t go with Faulkner and he came out playing like he should have received the preseason honor. As the season has wore on, he has become less effective, thus the need to fit in three other people into the net. Compare Faulkner to UMD workhorse McNeely, and the stats are quite close, but McNeely edges Faulkner in GAA and saves percent. In team comparison, both squads have allowed the same number of goals. Flying Freshmen. In looking towards the WCHA season awards, the freshmen at UMD look to be in the running for some accolades. The freshmen, and the future, are sixth in the nation in scoring at 33-51-84 points. Tony Cameranesi and Austin Farley have now moved into a tie with senior Mike Seidel for goal scoring leader on UMD with 14. Total points goes to Cameranesi with 14-16-30. In conference games, defenseman Andy Welinski is the highest scoring defenseman with 2-11-13. StatPack. At right are the statistical comparisons of the Bulldogs and red Mavericks. Unlike the last two weekends, the stats are a mixture of strengths. Despite a 6th versus 9th place series, the number of goals allowed is the same. Goals for tells the story of why the standings disparity. The Bulldogs improved both PP and PK standings in their series against UAH last weekend. UMD still is a nation leader in penalty minutes, but UNO is not far behind. The difference is the prowess Omaha has on the PK to score logging the six SHGs this season. Outlook. The odds state that UMD is expected to take at least one point this weekend. It doesn't seem likely the way the teams played earlier in the season against each other, but this is now. UMD should get at least a point, but that may very be it, one point. UNO has a lot to play for while UMD is locked at ninth. The hope, the expectation, is UMD will come out with fire and show that they are a threat in the first round of the playoffs. Around the WCHA and picks by @afiskness. 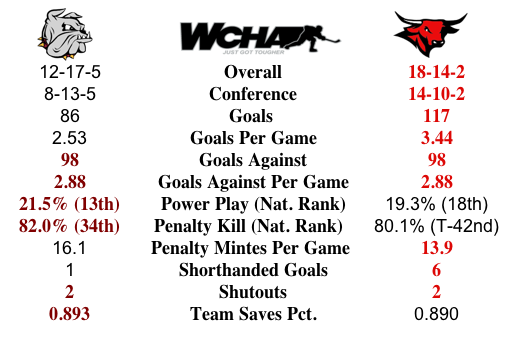 All 12 teams play in this final weekend of WCHA regular season and the WCHA regular season champion will be decided. There will be a lot of scoreboard watching in all the WCHA rinks. It is likely home ice won’t be completely decided until Sunday when Denver and Anchorage finish their second game of the series. A few weeks back I thought 30 points would be enough for home ice now I am predicting 33 points. It will be interesting to see how close my picks are to the final standings. Alaska - Anchorage at Denver: This Friday/Sunday series will likely decide the last home ice spot. The Seawolves have one road win this season and will not get one in Denver. Pioneers sweep. Colorado College at Michigan Tech: Both of these teams split last weekend against higher ranked opponents. The Huskies dominated St. Cloud in the Saturday win and will be hoping the momentum will continue for them at home in Houghton. The Tigers have lacked consistency and that will probably continue this weekend. Split. Minnesota Twin Cities at Bemidji State: The Gophers split at home against the Pioneers and now go to the smaller rink in Bemidji. The Beavers slow down game has been trouble for some teams this year and I think the Gophers could be affected. This looks like a Gopher win and tie for 3 points and a share of the MacNaughton Cup. North Dakota at Minnesota State Mankato: This is a big series for both teams and will be a real playoff test. North Dakota got three points at home and the Mavericks split on the road. Both would like to move up in the standings and I think they will each get 2 points in a split. Omaha at Minnesota Duluth: Last weekends' results for these two teams were opposite each other as the Bulldogs swept the Chargers at home meanwhile the Mavericks were swept by the Badgers. Omaha has more to play for this weekend as they are currently in sixth but could see that go to seventh without some wins. I think the Bulldogs have been playing well enough recently to get a split. Saint Cloud State at Wisconsin: This series will be played at the Dane, which is perfect setting for the Badgers to make their exodus from the WCHA. The Huskies win and the get sole possession of the MacNaughton Cup. Wisconsin bounced back last weekend and swept Omaha, I think their good fortunes will continue and the Huskies share the MacNaughton Cup. Badgers win and tie for 3 points. Miami and Western Michigan are off this weekend with byes in the first round of the CCHA playoffs.